This post comes after a long time as I was busy in traveling. This summer I was working as Google Summer of Code Student's for Fluid. After completing it successfully, when I was leaving the PC at my office on which I was working for my project I realized that I will lose track of all the technologies, sites and blogs etc. I had bookmarked as well as my browsing history, which Firefox uses to show suggestion while user types something in address bar. On googling a bit about this, I found out a solution for this. But there wasn't any software available to assist me with the process. So I decided to build one for me so that I wouldn't have to search again whenever I move my system. I then decided to build a software by which I would be able to see all suggestions from previous system as well as suggestions which was already present in the second system, and named it Firefox Takeout which can be found at here. This software works only on those Windows system on which English as Language is installed. 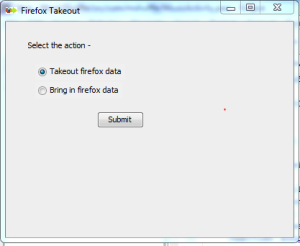 When user chooses 1st option that is Takeout Firefox data from first system; file used by Firefox for showing suggestion to the user while typing, is copied inside Firefox Transform folder located on desktop (It creates the folder if it doesn't exist). This completes 1st step. Now user can copy this folder and paste it on desktop of 2nd system. This is pre-requisite for the 2nd step. Now on the 2nd system, user can select 2nd option, i.e., Bring in Firefox data, this will send the file to the destination. This software was not difficult to build but it simplifies the life of the user to a great extent when user switches from one system to another specially to those uses which uses bookmarks and are not able to keep track of site visited by them. I think you will enjoy using this software. I will be improving the software's functions, look and feel in the future. Feel free to follow the development on the project page at sourceforge. If you face any problems, I would be glad to help.